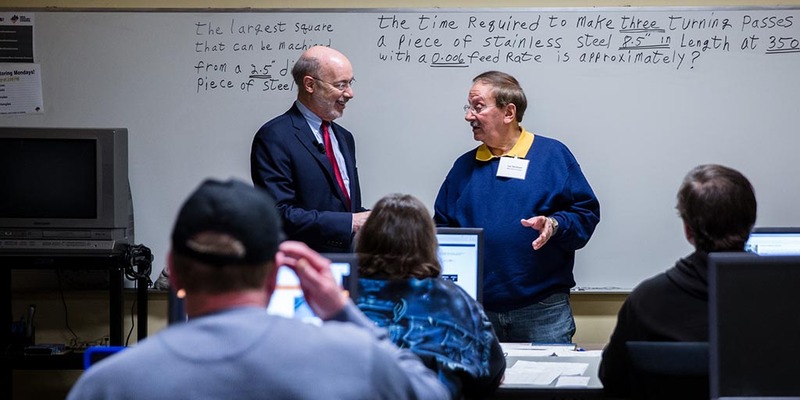 Harrisburg, PA – Governor Tom Wolf announced today that $1 million is available for Teacher in the Workplace grants that connect classrooms and businesses to help schools prepare students for the changing 21st century economy. The grants build on the governor’s commitment to strengthen partnerships between employers and educators, so teachers can provide students with the skills and understanding of thriving careers and industries in Pennsylvania. The Department of Labor and Industry is leveraging $1 million in federal funding through the Workforce Innovation and Opportunities Act to offer the grants in partnership with the Department of Education. Business and education organizations that partner with their local workforce development boards to implement Teacher in the Workplace programs are eligible. In his 2018-19 budget, Governor Wolf proposed PAsmart, a new workforce development initiative to improve coordination and services across Commonwealth agencies. PAsmart provides a $50 million investment in education and job training that includes funding to encourage employers to partner with colleges and universities to develop educational programs that prepare students for high demand jobs. Teacher in the Workplace grant information and the application is available on L&I’s website. The application deadline is April 25, 2018.